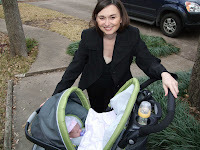 I spent the first week (or two) after Alice's birth wearing pajamas and sitting on the couch. After my 2 week incision check, I was starting to feel more normal...still some pain getting up to a sitting position, but once I'm up, I'm just fine. By week three, I began to get dressed and somewhat "made up"...fix the hair, limited makeup, etc...and along with that, the urge to get out of the house more. Even though it is January, the weather has been nice and warm, so I decided it was a perfect day to take a walk. I dressed Alice in a pink jumper and cap (given to Alice by her Aunt Sissy) and placed her in the car seat that snaps into the stroller. 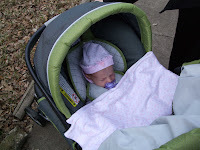 Alice promptly fell asleep for the duration of the walk. Maybe this is something you can use when she's fussy!? You look beautiful Cristy.